What are your thoughts on the U-23 Eagles team’s 4-0 thrashing of their Libyan counterparts in the AFCON U-23 qualifier here at the Stephen Keshi Stadium, Asaba? It was a good result, good performance by the team. There was cohesion among the players. The result did not reflect the true flow of the game. Except for hard luck, the margin would have been more. I’m not surprised because the boys pushed well, they dominated the game from start to finish and even hitting the crossbar and woodwork twice. Generally, it was a good performance by the team. Sudan are the next in line for the Nigerian team. What are your expectations in the match given the fact that it is the last qualification game before the CAF U-23 AFCON finals? On the strength of what the team did today (March 25) against Libya, I’ve no doubt they will beat Sudan and pick the AFCON U-23 ticket. You sound so confident. Aren’t you envisaging a tough match against a Sudanese team that is probably dominated by the players that eliminated the Flying Eagles from the 2017 U-20 AFCON? I’m confident because I believe this team has quality. They can go places. But I’m not being carried away. I know Sudan game will be tough, yes, very tough. It is the last game to the AFCON so they will throw everything into it. But our experience will see us through. Besides, the players will be motivated by the desire to avenge that (U-20) defeat two years ago. (Cuts in) The Europeans believe that football runs in certain bloods. Take the case of the Okallas (Emma and Patrick), Atuegbus (Andrew, Matthew and Alloy) and then the Odegbamis (Segun and Sola). In our own (Nwakali) case, it would have been three or more. It started from our grandfather, then to our father and later myself. But because my father was a teacher and I’m the first son, he made sure I didn’t go further. I played the game, maybe not at a top level. Then came my immediate junior, Nnabuihe before Chidiebere and later Kelechi. Are you saying it is kind of a generational thing? Yes, something like that. When my father died, and I saw the talent in Nnabuihe, because he started before Chidiebere and Kelechi, I tried to push him. Later, Chidiebere and Kelechi came up. When I saw their talents, I took it upon myself to encourage them. I was a footballer so I know what was involved. I tried my best to make sure I pushed and encouraged them to actualise their potentials. Chidiebere made it to the U-17 Golden Eaglets World Cup in 2013 in UAE. Kelechi would have equally made it except a shin injury when he went to Portugal for a tournament with Diamond Academy alongside Samuel Chukwueze. There Chukwueze emerged as top scorer with 11 goals. Kelechi was adjudged as the Most Valuable Player, MVP. When they came back, NFF pushed them into the U-17 national team. That was how he missed the 2013 U-17 World Cup. Chukwueze also did not make it. But coach Manu Garba comforted Kelechi, telling him in confidence that he is still young and that he, Garba, would push him to the next U-17 team once his injury was healed. Kelechi later became captain of the U-17 Eaglets in 2015. They won the World Cup in Chile. He won the MVP and on return was signed by Arsenal just as Manchester City signed Chidiebere in 2013 when they came back from United Arab Emirates, UAE. That’s the story of the Nwakali Football Dynasty. That’s very interesting. But are you not worried that despite their performances, they are yet to make it to the Super Eagles? I know there is time for everything. That’s why I don’t want to rush or push anything. When their time comes, they will take it. 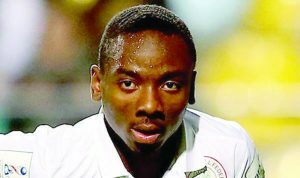 I know Nwakali is now a household name in Nigeria. And of course, everybody knows them to be good players. So I believe that when their time comes, they will make it. Everybody saw him (Kelechi) in the Super Eagles match against Atletico Madrid in Uyo. People also saw him in the (U-23 Eagles) game against Libya. I believe there is time for everything. There are still the Mikel Obis and (Oghenekaro) Etebos in the Eagles squad. All of them can’t play at the same time. They are all senior players to Chidiebere and Kelechi Nwakali. I believe that in time to come, Chidiebere and Kelechi will break into the Super Eagles and lay strong claims to regular shirts. There is no two ways about that.